← La Grave – Most Extreme Ski Resort in the World? As summer approaches, many parents find themselves wondering how their children will spend their well-deserved summer vacation. Many teenagers plan on traditional options like summer camp or just plan on ‘hanging out’ with their friends or logging some time on their favourite video game system. There is nothing wrong with some lazy summer days, but many teenagers want fun and adventure! Evolve Chile offers an absolutely incredible summer camp for those who like to spend time on the slopes, and this is one awesome adventure they will absolutely love. 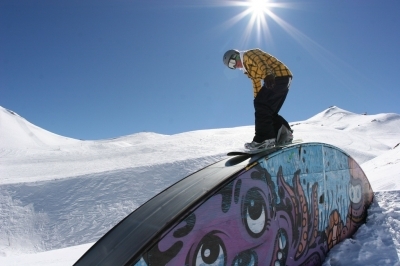 Evolve Chile offers one of the coolest summer experiences a snowboard or ski lover could imagine, as their ski and snowboard programs transport kids to the beautiful country of Chile where they will spend the summer on the slopes of the magnificent Andes Mountains. The purpose of the Evolve Chile Camp is to provide campers with a challenging program in their activity of interest while taking into account each camper’s willingness and capacity to face the challenges responsibly. Evolve take pride in teaching new skills to their campers, and over the course of the summer they expect them to increase their confidence and performance on the slopes while making some new friends along the way. Whether they are trying to land that stale-fish 360 on a snowboard or are more interested in working on tightening up their transitions and control on skis, their professional coaches work with everyone individually to understand and address their specific goals. Besides the time spent on the mountains, campers get to experience an amazing country with a unique culture while discovering South America. Evolve understand that parents get concerned about the safety of their children while they are spending time away, especially in a foreign country. With that in mind, they take every safety measure possible to minimize the risk for accidents. Although their ski and snowboard camps are designed for campers whose sports capacities range from intermediate to advanced levels, their professional coaches will evaluate each of the camper’s skills and make sure they are comfortable with the given terrain. Once the staff have evaluated a child’s snowboarding or skiing skills, they will promptly design an individualized plan that is challenging, yet safe. In addition to this, the camp provides all participants with helmets as well as avalanche safety training. While it’s summer time in North America, the southern hemisphere experiences their winter season, and Chile is home to incredible terrain that is ideal for skiing and snowboarding. Besides learning new skills, young campers will explore beautiful mountain sites under the guidance of their coaches during the Free Ride Sessions. Free Ride Sessions give campers the opportunity to choose the activities in which they want to participate. Whether they decide to explore the landscape in an energy-filled or tranquil manner, Evolve Chile’s summer camps promise to meet every expectation held by their campers. Another reason why vacationing in Chile is so appealing is the culture and friendly locals. Teenagers not only get the chance to experience the vacation of their dreams, but they may also end up building everlasting friendships during their stay. When it comes to extreme summer vacationing, skiing or snowboarding in Chile with Evolve will be an experience your kids will never forget! The best vacation that Eric Cabot and his family went on was spent skiing in Chile. As avid skiers they missed their favourite activity during the summer until they discovered the option to go South American skiing during the summer! This entry was posted in South America, Travel and tagged Chile, Evolve, Evolve Chile Camp, Evolve Summer Camp. Bookmark the permalink.